Not all Major League Baseball records are created equal. The sport that revels most in statistics and history is full of numerical oddities that go way beyond who hit the most home runs. The career of Rich Sauveur is a case of one of those oddities. The name may be unfamiliar to all but the most trivia-obsessed baseball fanatics, but Sauveur -- who's heading into his 15th season as a pitching coach, fourth in the D-backs system -- carved out a unique piece of history in a league that dates to 1876 and in a sport that has had over 19,000 players call themselves big leaguers. Over the course of a career so long that he appeared as a Major Leaguer in three different decades but so unusual that he didn't lose his rookie eligibility until his sixth and final season in 2000, Sauveur set a record that still stands by pitching for six Major League teams without earning a single win. The Virginia native began his professional journey in 1983 as an 11th-round Draft pick of the Pirates. Not considered a top prospect by any means, Sauveur showed enough during his lone season at the State College of Florida, Manatee-Sarasota that Pittsburgh made him the 253rd selection that June. On July 1, 1986, he found himself on the mound at Three Rivers Stadium pitching against Hall of Famer Mike Schmidt and the Phillies in his big league debut. Another of the Pirates' young prospects -- Barry Bonds -- patrolled center field in his 34th career game. Sauveur pitched well that night, allowing two runs over 6 2/3 innings but didn't factor in the decision in the Pirates' 5-4 loss in 12 innings. He started twice more over the next 10 days -- accounting for the only three starts of his Major League career -- before he was optioned to Triple-A Hawaii. He spent all of 1987 with Double-A Harrisburg, posting a 2.86 ERA and a career-high 13 wins. The Expos selected Sauveur in that year's Rule 5 Draft, kicking off a merry-go-round of transactions that would lead him back to the Pirates, to the Expos again, and to the Mets, Royals, Reds, White Sox, Dodgers, Cubs, the Reds for a second time, the Pirates for a third time and finally the A's. "I won't say [going winless] doesn't bother me," he said. "But I don't lose sleep over it. ... I know that I made it and a lot of people who have loved to have accomplished what I did, but I'm very humble about it." All told, Sauveur made 34 appearances in the Majors -- 31 as a reliever -- with Pittsburgh (1986), Montreal (1988), New York (1991), Kansas City (1992), Chicago (1996) and Oakland (2000). His final big league numbers -- 0-1 with a 6.07 ERA and 1.78 WHIP -- pale in comparison to a successful tenure down on the farm. He won 91 games and had a 2.91 ERA over 18 years and 611 Minor League games. A rookie no more, Sauveur decided to call it quits following the 2000 season. He was 36 years old. "It's cliché, but [I kept playing] for the love of the game," he said. "I loved everything about baseball and loved playing it. If you're fortunate enough to make money playing a game, you do it. Like most other guys, playing in the Majors was my dream when I was growing up ... and I got to do it. As the years rolled by, I never felt like I was getting older. That played a part in why I kept playing. I made it [to the Majors] for the last time in 2000 with Oakland. It had taken me four years to get back, so at that point I figured, 'That's enough.'" While it's a distinction of dubious honor, Sauveur doesn't shy away from his spot in baseball's record book. "I won't say [going winless] doesn't bother me," the southpaw said. "But I don't lose sleep over it. When I talk to people about my career, I mention I played for six teams and the record ... We joke about it. But I know I made it and a lot of people would love to have accomplished what I did, so I understand how fortunate I was. I'm very humble about it." Sauveur held off the itch to get back in the game for two years and stepped into the role of pitching coach for Class A Beloit in 2003. He returned to the Midwest League the following year, then made the jump to Double-A Huntsville for three seasons before leaving the Brewers to join the Red Sox. Sauveur spent the next seven years with Triple-A Pawtucket before reaching a crossroads after the 2014 campaign. "For me, it came down to the feeling that I deserved an opportunity [in the Majors]," he said. "The Red Sox had changed pitching coaches three consecutive years and I wanted to know why I didn't get the chance. We spoke and they gave me specific reasons for each of the three times I was passed over. It really had nothing to do with me but more with circumstances. I appreciated their honesty, but at the same time, I felt I needed to move on. But I have nothing but good things to say about the Red Sox. They're a phenomenal organization." 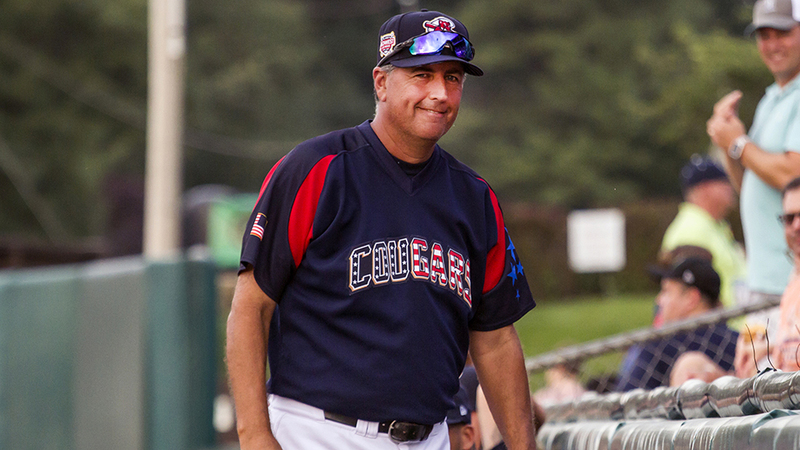 Sauveur stayed off the diamond in 2015 but found himself back in the Midwest League when he was hired by Arizona to serve as Kane County's pitching coach in 2016. After three seasons with the Cougars, he will begin his 15th year coaching with the D-backs' Rookie-level Arizona League squad in 2019. "I learned so much from watching other pitching coaches," Sauveur said. "Some guys need a kick in the [pants]. Other guys don't take that too well and need a pat on the back. Some need both. That's one of the big things you need to learn, because if you choose the wrong method, it can backfire." In his playing career, he pitched for a host of coaches, including the late Mel Stottlemyre with the Mets and Rick Peterson with the A's. But it was one of his first mentors that he comes back to as someone who helped mold him into a big leaguer. "Spin Williams is one of the pitching coaches that really sticks out to me," Sauveur said. "I had him for several years with the Pirates and he was very helpful to me. A lot of coaches weren't as hands-on back then, but he always tried to help me and find the right way to do things. I learned a lot from him." Sauveur's staffs have posted a sub-4.00 ERA 11 times in his 14 seasons coaching. But that's not to say the job is easy. Life as a pitching coach is much more sophisticated than it was when he played. "It definitely has become more of a challenge, especially the last few years," he said. "We still teach the fundamentals, but the technical aspect of things is really something else. I wish we had them back when I played -- so much of the analytics that go into the game and how we teach. I really like it. I think it's a big help to what we're trying to accomplish, but at the same time I don't feel it should be the only way of doing things. There's a balance you need to find." Sauveur has coached numerous big leaguers -- Clay Buchholz, Yovani Gallardo and Andrew Miller to name a few. More will soon follow, likely including Jon Duplantier, who studied under Sauveur in Kane County during the first half of his first full season (2017). The top D-backs prospect went 6-1 with a 1.24 ERA in 13 appearances before earning a promotion to Class A Advanced Visalia. "He showed me that he had confidence in me, which in turn gave me confidence in myself," Duplantier said. "Rich kept stimulating my mind. A lot of stuff would come together for me during games, but he found new ways to challenge me during our side work. He helped turn my sides into a competition with myself. That was a key moment for me as a pitcher learning the game. "Rich knew what I needed. I can't speak for everybody, but he handled all the guys as they needed to be and adapted on the fly. He could show you tough love but then ease off in the next moment. It showed he understood us. I was very fortunate to have him, especially at the period [of my career] when I did." Duplantier's experience is music to Sauveur's ears. It's what he hopes all his pitchers can glean from his tutelage. "I'm not going to lie -- I enjoy seeing guys I worked with get to the Majors," he said. "There was nothing better for me than being in the room when our manager [with Pawtucket] would tell a pitcher he's going up for the first time. I can't help but be proud that I played a small part in that. "Things are different at the lower levels. Being down in the Arizona League, I'll have to repeat myself a few more times, I'm sure. There's a lot to go over with kids just starting out. But at the same time, you don't want to fill their heads with too much. You go over the basics and analytics, but the pitchers will show you who stands out, and you go from there. It's just a little slower compared to Triple-A." As Sauveur prepares for his 34th season in professional baseball, he finds himself reminiscing on his time as a Major Leaguer. Wins or no wins, he's proud of a career that has helped him earn a living for more than half his life. "I played in the Majors, even though I wasn't able to stay there," he said. "But I got there. I enjoyed every second of it. Looking back, I won't say I wouldn't have done some things differently. But as far as the time as a big leaguer and the guys I played with and for ... I wouldn't change a thing."